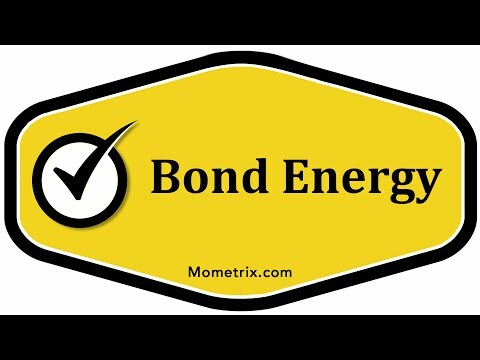 Bond energy is the amount of energy required to break a chemical bond thereby forming natural elements. Now, bond energies are usually measured between elements while in a gaseous state. Bond energy is often expressed as the amount of energy required to break one mole of the compounds into elements. So what you have is elements combined together to form compounds, and so it takes a certain amount of energy to break those compounds back up into its original elements. And so bond energy is a measure of the amount of energy it takes to break those compounds back into the original elements. Now, bonds with low energy are easier to form and to break, so low energy equals easy to form and break. So when you think about compounds, first the elements had to be formed into those compounds, and then we’re looking at bond energy which is the amount of energy it takes to break those compounds back into elements. So if there’s a low amount of energy, it’s easy to take those elements and form them into compounds, and it’s easy to break those compounds back up into elements. Now, high energy has basically just the opposite affect of low energy. High energy equals difficult to form and break. So compounds that have a high energy are going to have a higher bond energy and compounds that have lower energy are going to have a lower bond energy because high energy and low energy plays a large role in determining how large the bond energy needs to be.